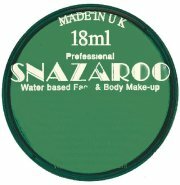 Green 18ml tub of water based face paint. Apply with a wet brush or sponge. Colour not accurate in picture, paint is emerald.